The Blue Line is distinctive in that the tunnel that carries it from downtown to East Boston is the first subway tunnel ever to run under the ocean! The tunnel opened in 1904, and its original purpose was to carry streetcars from East Boston to downtown Boston. Yes, the Blue Line did once run streetcars. Until 1924, when the line was converted to subway cars, streetcars entered the tunnel through the Maverick Square Portal, where Maverick Station on the Blue Line is today, and crossed the ocean to reach downtown. A streetcar exits the Maverick Portal back when the Blue Line ran streetcars. This is the location of the present-day Maverick Station on the Blue Line. Image courtesy Boston Transit Library. Streetcars ran along the Blue Line until 1924, when it was converted to run third-rail subway cars. Streetcars continued to enter the tunnel at Maverick Station; however, they now looped at the new underground station that was built to serve the subway cars. When the Boston, Revere Beach and Lynn Railroad ended service in the early 1940s, the third-rail Blue Line was later extended north to Revere along the old Railroad right-of-way. Government Center Station—Note the lower platform in the distance. 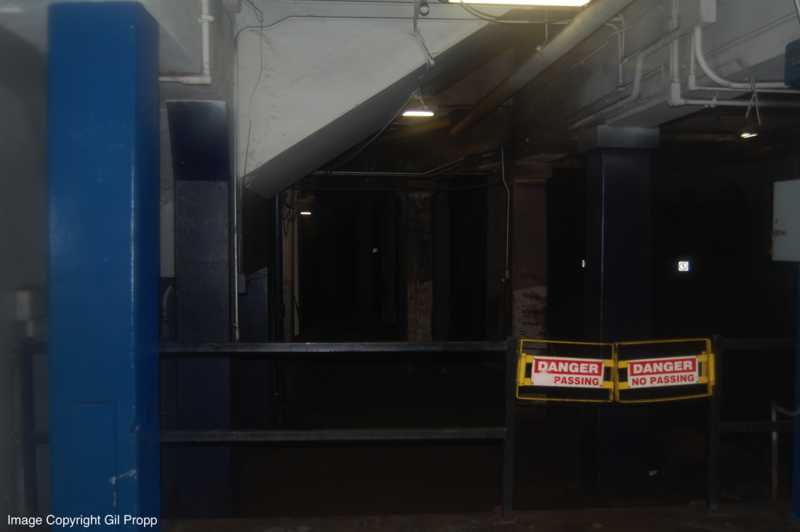 Also note the "Scollay Under" sign, a remnant of when the station was called "Scollay Square" back when Scollay Square stood on Government Center—More to follow on the Scollay Square-Government Center conversion in the "Articles" section in the near future. A closer view of the streetcar platform is provided below.